MRA’s Kern River campground is a fully equipped campground with 34 camp sites (see map below), deluxe bathrooms, hot showers, drinking water, picnic tables, fire pits, and group gathering area. Located along the banks of the Kern River, enjoy immediate river access for fishing, horseshoe pits and hammocks to relax in after a great day of adventure. Call us today at (800) 861-6553 to reserve your camp site! Out of the hustle and bustle of downtown Kernville, our campground is located just 2.5 miles north of Kernville. This area is also our check-in center for Class IV-V river trips on the Forks, Upper and Lower Kern. 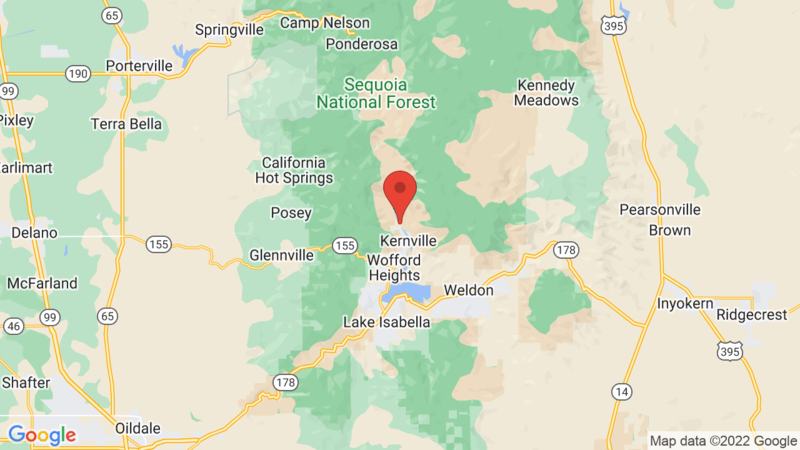 Man folks enjoy that they can drive to one location in Kernville, set up camp, and then walk over to check-in for one of our exciting Kern River rafting trips. If you come to Kernville to just get away from it all, our campground is a great place to relax. With amenities* such as volleyball, shuffle board, horseshoe pits and convenient river access we can help you fully relax and enjoy. We also encourage you to join us in helping to preserve the ecology of the Kern River. Upon entering Kernville, continue through to the stop sign at Kernville Road and Sierra Way. Turn left (north) on to Sierra Way and drive approximately 2.5 miles up river. Our campground is located at 15775 Sierra Way, on the left side of the road and you may enter where you see our MRA Campground sign next to our welcome bear! Visted Mountain & River Adventures Campground Campground lately? We'd love to hear about your adventure. Did you find us useful? Did we forget something? Anything our community should know before heading out to Mountain & River Adventures Campground?